The often humourous Donald Fraser emceed for the evening and to get us into the cycling frame of mind, he asked people to stand who we're involved in different cycling groups. He would ask "Who cycled to tonight's event? ", or "How many road cyclists?" there were. The most impressive result came when he asked, "Who is a cyclist?" Pretty much the entire crowd stood, which lead to a good chuckle. Councillor Len Vass - Chair of Transportation. Vass says he is always pleased to see people come out to effect policy change and thanked people for coming out Wednesday night for the transportation meeting. Cycling strategy is a very important part in his role of moving forward with the Cycling Master plan, he says. The City approved its comprehensive transportation plan and review and it included a 20-year cycling network valued at between $26 and $37 million dollars. Vass said he hopes with the help of Susan Sauvé, Brian Buchardt and others, that they can improve the cycling within the community. 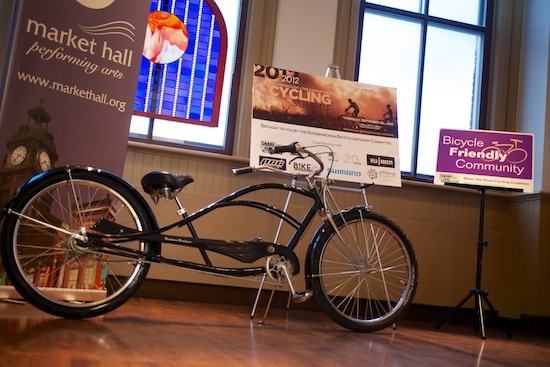 He mentioned the current initiatives that they are doing such as the installation of new cycling bike racks and repair stands, Bikefest, Two-wheel Drive information session, recognition from Share the Road, as well as the Shifting Gears event. 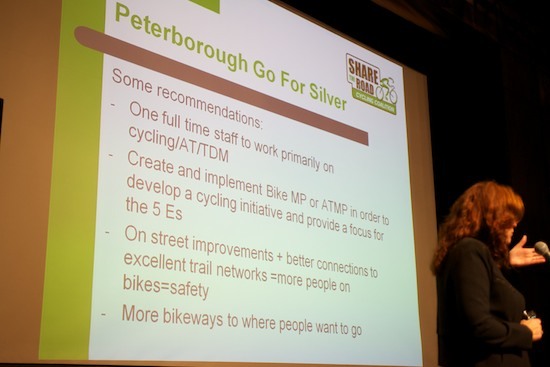 Those are some of the things that made this a very busy year for the city of Peterborough in the area of cycling. He adds they're looking for your assistance to help the City move forward with your input to generate success in this area. Barry Rand - Deputy Warden of the County of Peterborough. Peterborough County does recognize the importance of upgrading our roads, but it can be difficult with the wide area the County covers and the fewer residents per capita, Rand says. We are trying to incorporate these priorities into the Transportation master plan. It is a fiscal challenge, but they have made significant headway. Innovation in road preservation techniques is helping to free up money. 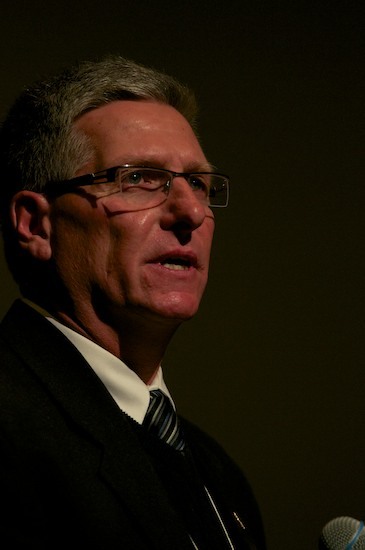 Municipal tax base isn't enough to fund our 10 year capital requirements, he says. The fundamental responsibility is on Federal and Provincial Governments to participate with us and commit on a long term plan. There has been a focus on low volume roads because that is where the cyclists are enjoying the roads. Eleanor McMahon. CEO and founder of Share the Road. 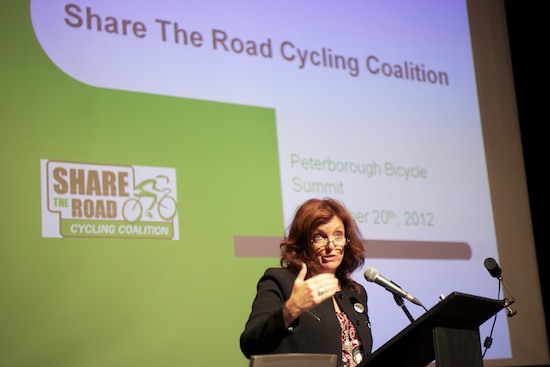 McMahon believes that Share the Road are doing what the Government should have been doing years ago: bicycle advocacy. They have numerous recent accomplishments, among such are the fact that they are very engaged at City Hall, created a province wide ad campaign, a bicycle tourism strategy, created provincial policies, legislation, and infrastructure funding and the Ontario CAN! (Cycling Advocacy Network). She believes that there is a growing recognition of the many benefits of cycling (the fastest growing sport in North America) such as improved health, quality of life, addressing climate change and transportation solutions. They have even contributed to the Coroner's report in regards to cycling deaths and ways to address this. The Share the Road campaign even came up during the August long weekend traffic report from the police, she notes. McMahon talked about re-introducing cycling and road safety back into the classroom, just the way Elmer the Safety Elephant used to provide. A great initiative, the Ontario Youth Bike Summit will be coming next year, so help spread the word. From surveys, Share the Road discovered that Ontarians would like to ride more (58%). The main reason they said they wouldn't is because they were afraid to (safer roads was the number one requested item). If they had the opportunity to bicycle more often, they would primarily do it for recreational pursuits, followed in turn by commuting. 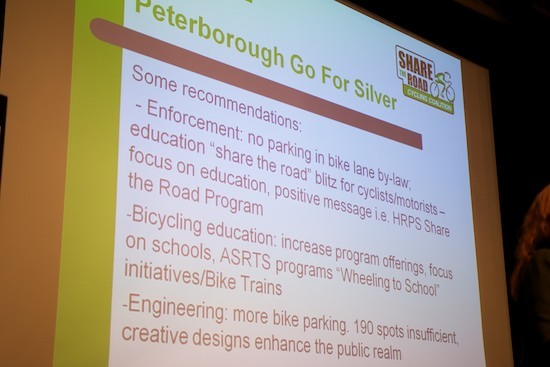 It was noted that Peterborough won Bronze at the Bicycle Friendly Community Awards. Share the Road is hard at work on the masterplan, which is key for future development. They believe that Ontario needs to focus on cycling tourism, which is already prevalent and profitable elsewhere such as in the United States. Susan Sauvé. Transportation demand management planner at City of Peterborough. There wasn’t much of a cycling infrastructure before 1995, she says, but as of now in the City of Peterborough, we have 27km of multi-use trails, 20km of paved trails, 6km of side paths along roads, and 12km of full cycling lanes (with an additional 8km where parking is permitted during part of the day). New additions include the work done to Medical Drive (which has a side path running along it), bike parking, directional signage, the bike fix-it stands (thanks to a lead from the Community Cycling Hub) and our first on-street bike parking racks. Next Tuesday and Thursday will be the first city-wide pedestrian and cycling count (be sure to wave to the students with clipboards as they will be counting you). She notes they hope to do this annually to track trends over time. The infrastructure recommendations in the masterplan are pretty significant. Currently she notes we have 53km of on-road and off-road cycling facilities, and the proposed network would be more than triple that (183km). The plan also recommends some upgrades to the existing infrastructure such as the Water and George Street bike lanes and side paths along Lansdowne and Clonsilla. There is a lot of work ahead to implement the plan (over the next 20 years), but it comes at a price. They want to know what the residents of Peterborough consider a priority. Sometimes the changes can be planned in advance, but other times such as the Lansdowne Street West changes meant that it was better to implement it at the time of construction rather than trying to add on later. There will be an Open house in October to look at by-laws and road use for Active Transportation on roads and sidewalks (Cycling, Skateboards, etc). Complete Streets is an initiative to look at shifting transportation planning from "moving cars" to "moving people". The first target is George Street near the Holiday Inn where it is difficult for pedestrians to cross (or even make a left hand turn). Here is a proposed plan for transforming the area so that it is better for all modes (cars, bicycles and pedestrians). Brian Buchardt. Planner The City has money to do an engineering analysis on the railway bridge. CP Rail decided they were going to replace the rails on the bridge, so came along with a great big machine that pounded spikes into the bridge. This shook the bridge pretty dramatically and the walkway began to slump, and then detach (much to the dismay of the pedestrians). This walkway is a key segment of the Trans-Canada Trail and provides access into East City and its features such as Rogers Cove and Beavermead Park. How will they engineer a new walkway? 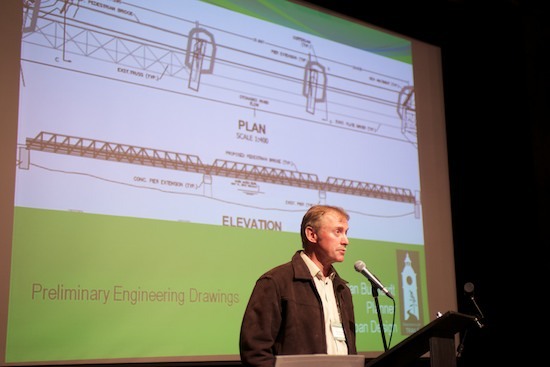 They could build a new bridge (at a tremendous cost and subject to environmental approvals) or talk to CP to figure out a new way to build a trail. After analysis, it was determined the best way was to take advantage of the existing peers and modify them. The new walkway won’t be attached to the superstructure. There will be a 3 meter width for all to enjoy. There is a $2.5 million budget requirement, and Peterborough is responsible to repair the bridge. Funding partners needed include a community infrastructure investment fund, an application to the Federal Government, a capital levy and a provincial surplus reserve, and Federal Gax Tax money will all help provide the funds. Another project is deciding what to do with the other end of the trail, which is part of the Trans-Canada Trail (which currently goes through side streets). They plan to go down Maria street, which they believe is the right thing to do, and connect with Rogers Cove. A question was asked about the metal gateway before and after the train tracks and its purpose when currently, people can just walk around it. Brian Buchard dubbed it “the maze” and said that CP Rail enforced it and eventually there will be fencing put up so that you will have no choice but to use it to cross “their property”. It was actually retrofitted so that cyclists with trailers could navigate it (although it is still a little difficult). Repairs to the bridge begin in November and are estimated to be complete in the Spring of 2013. Zac Wheeler and Zach Wynen. Spoke about Haroldtown and as the trail system developed, it became such a draw that parking became the first issue. It created a dialogue and a framework on how and when trails are built, signage, and safety standards. The framework has been put into a booklet entitled “Harroldtown Conservation Area Public Use Safety Manual for Non-motorized Multi-use Trails”. By developing the booklet, it has legitimized what they do. Now they have a partnership with the conservation authority, a parking lot, a tool shed, and tools (money was donated for tools by the Peterborough Cycling Club). Originally there was a group of 30, to now over 200. It took about 150 man hours of labour to build the trails and have added 2km of single track to the main trail. The terrain isn't easy to work with, but a beginner trail system will start in the Spring of 2013. The Conservation is mapping the land, which will help with upcoming signage to help riders find their way though the trails. Chris Bradley, director of Public Works, County of Peterborough We do have the go-ahead from the Ministry of the Environment to Proceed with the Airport Road project which is a great interest to the cycling community, he says. It will still take some time, but the RFP is almost complete and the design work will be available in the next six to eight months. To put cycling lanes on the roads would cost a significant amount of money, which currently is aimed at repairing bridges and roads. Go to the county of Peterborough's website and post a comment as they are updating the County Transportation Masterplan Update with a completion date of December 2012. So far there hasn't been much feedback, so you have a great opportunity he notes. They are looking to find a way to integrate the traffic volumes with the people who use the trails for commuting, or for leisure. They are also looking to take trails and do small steps to improve them. Roads such as County Road 40 have a grass-line-to-grass-line paved surface, which are easier to maintain and gives people a place to ride without competing with traffic. PIC #3 is coming up, and they are looking for input! Bradley thinks they are on the right track, but can't emphasize how much they are looking forward to feedback.